In this first blog post for 2019, Professor Deborah Hall, Vice-Provost (Research and Knowledge Exchange) gives an overview of some of the outcomes from January’s campus visit by some of our key university strategy leads in the UK. 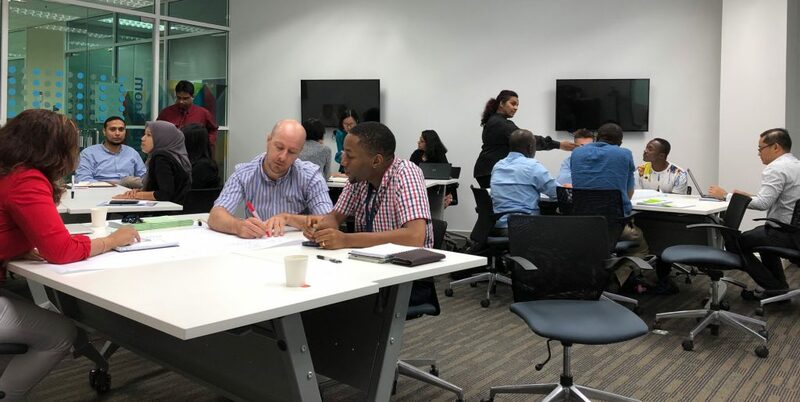 The University of Nottingham Malaysia (UNM) reputation campaign in April 2018 was extremely successful in its reach across Malaysia and beyond. UNM’s research strengths played a key part of the messaging and deliverables of reputation campaign which focused on the high-quality research being undertaken at UNM. Three research areas and 16 academics were chosen on the basis they were areas of impact tackling some of Malaysia and ASEAN’s key challenges (food and sustainability; health; and the environment). But let’s not forget that UNM has fantastic researchers working in many other areas; we have lots of hidden gems to shine our spotlight on. The current call for Research Centres is the first step to refreshing UNM’s narrative about our Research Vision at UNM. Research Vision Malaysia will give focus to the direction of research at UNM over a five-year period. The Centre call is one way to review interdisciplinary research opportunities and ambitions at UNM. Centres will become the main way UNM delivers its Research Vision, focusing on the quality of our research, its potential for both impact and application in the region, its potential to secure funding in a changing and challenging funding environment, and to understand the future sustainability of particular research areas within UNM, as well as how these research areas align with government priorities. This latter point is important if we are to leverage funding/grant opportunities and to build Malaysia’s reputation for research strengths in areas that are relevant to the health and wealth of Malaysia and Southeast Asia. It’s also important for the sustainability of our research ecosystem at UNM. All of us are aware of current trends in Malaysia such as continued research funding challenges, new entrants in the market such as Japan, and some degree of national protectionism on research. Continued promotion to raise awareness of UNM’s research base and continued engagement of this research with priority audiences is vital in ensuring profile. Creating a strong consistent narrative about research at UNM will encourage partners both internally in the UK and China, and externally to work/collaborate with us. Therefore, with the wider support from the UK, I am already planning a series of targeted activities throughout 2019 and into 2020. In May 2019, I will be presenting the Research Vision Malaysia to Research Committee UK. This will be developed in conjunction with Dr Elizabeth French, Head of Strategy, Policy, Performance and Impact (UK) and our Research and Knowledge Exchange Committee Malaysia. Throughout 2019, I’ll be working developing the content and messaging, as informed by the overarching new research strategy for the University of Nottingham, and the ‘One University’ approach. It’s my intention to launch the Research Vision Malaysia and our Centres ‘Beacons of Excellence’ in Malaysia in 2020 with an internal event at the start of the year followed later on by an external launch to coincide with celebrating our 20 years anniversary. I’m really excited by the prospect of galvanising the UNM academic community to own and drive the Research Vision Malaysia, giving a purpose and direction to our research endeavours. Please do engage!